Albirex Niigata maintained their nine-point lead at the top of the S. League at the weekend after toiling to a 1-0 win over Brunei DPMM at the Sultan Hassanal Bolkiah National Stadium. The only goal of Saturday’s game arrived in the 26th minute when Naofumi Tanaka reacted quickest to a loose ball to stab home, after opposition goalkeeper Mu’izzuddin Ismail had spilled a free kick by Kento Nagasaki. The victory allowed the White Swans to tentatively extend their advantage to 12 points, although they were pegged back on Sunday when second-placed Tampines Rovers beat Balestier Khalsa 1-0. Following a goalless first half at the Toa Payoh Stadium, the breakthrough for the Stags arrived eight minutes after the restart when Hafiz Abu Sujad’s left-wing cross was nodded by Ryutaro Megumi into the path of Fazrul Nawaz, who made no mistake in sending a looping header past Zaiful Nizam. 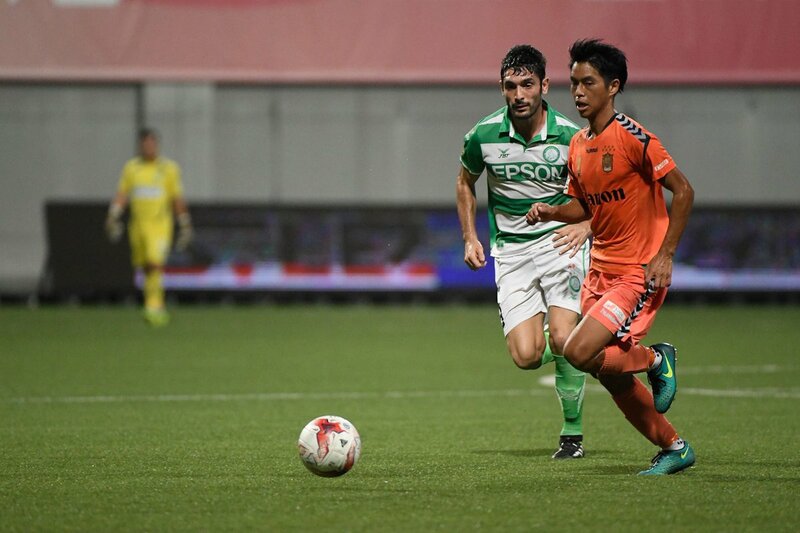 The biggest movers of the round were Geylang International as they leapfrogged Warriors FC into fourth spot after recording a 2-0 triumph at the Choa Chu Kang Stadium on Friday. The Eagles broke the deadlock in the 78th minute when Faritz Hameed’s right-wing cross had evaded Warriors keeper Hyrulnizam Juma’at. Four minutes from time, Geylang made sure of the victory after more poor defending from the Warriors allowed Shawal Anuar to meet a Shahfiq delivery with a clever downward header beyond Hyrulnizam’s despairing dive. Finally, the last match of the round saw bottom side Garena Young Lions handed their 12th defeat in 16 games as they were beaten 2-1 by Hougang United. It took the Cheetahs just a minute to break the deadlock at the Hougang Stadium when Pablo Rodriguez netted with a towering header at the back post, before Nurhilmi Jasni did well to make it 2-0. The Young Lions pulled one back eight minutes before halftime through a sublime 25-yard freekick from Rusyaidi Salime but, despite their best efforts, they were just unable to find the equaliser with Hougang custodian Khairulhin Khalid in inspired form.